These 10 karat yellow gold open design Shamrock studs are a modern twist on a traditional symbol. With the heart incorporated into each leave of the shamrock they are a perfect gift for your loved one. 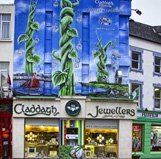 Claddagh Jewellers Home of the Authentic Claddagh Ring, from Galway with Love!